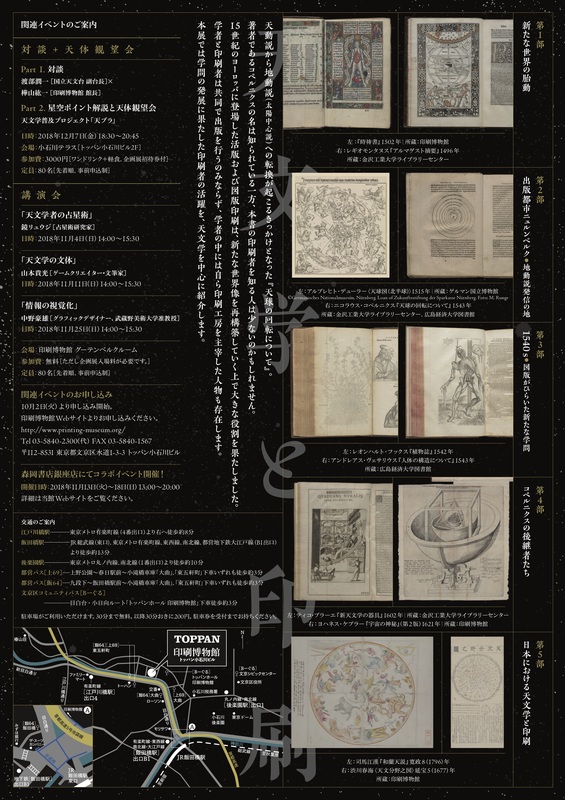 Astronomy and Printing, a special exhibition at the Printing Museum, Tokyo. The exhibit brings together nearly 100 printed objects stretching from the 1450s to the 1870s. In addition to showing an impressive range of items, the flyer and brochure are truly beautiful. 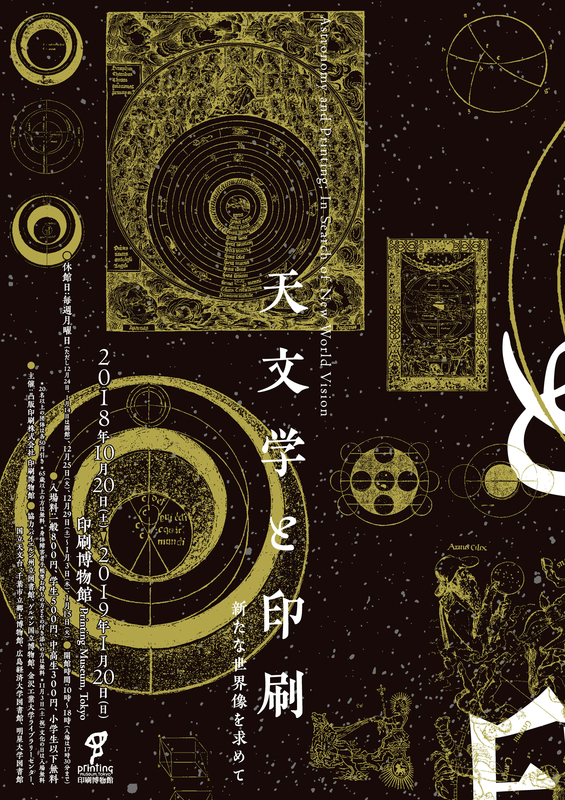 The amazing flyer for the “Astronomy and Printing” exhibition. 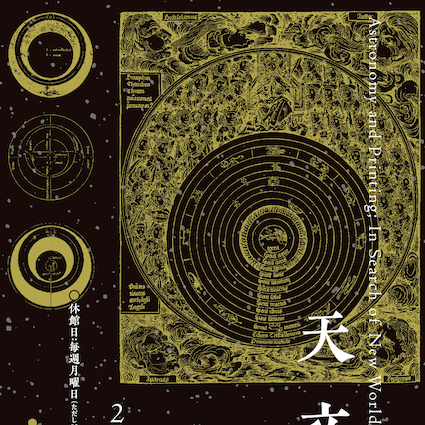 The museum also hosted some lectures on the history of astronomy, alas now all past. 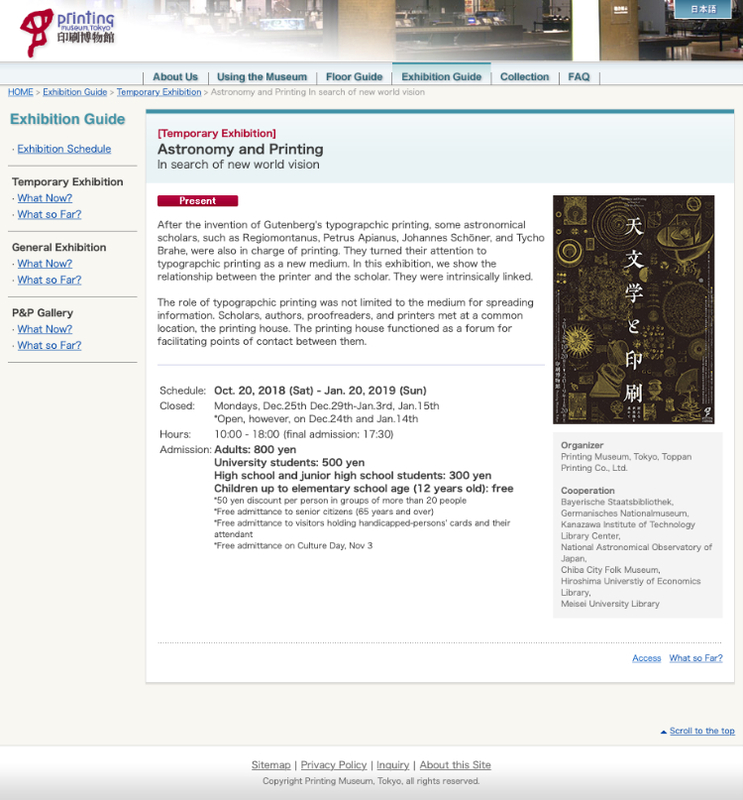 On the back of the flyer were listed the various lectures that accompanied the exhibit. The brochure lists the objects, a list that includes all the expected authors and works, e.g., works by Pliny, Ptolemy, Hyginus, Albumasar, Peurbach, Regiomonatus, Dürer, Apian, Fine, Brahe, Kepler, as well as a number of Japanese authors, etc. 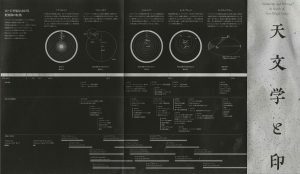 It also has a nice timeline with authors and references to the books on display as well as cosmological diagrams. 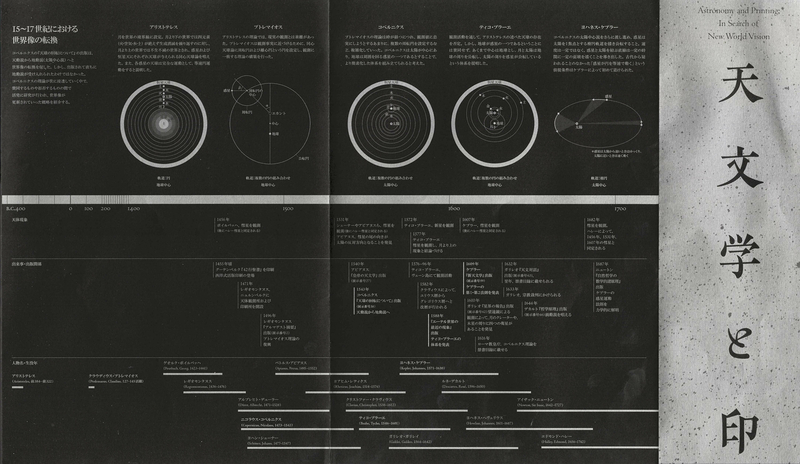 The brochure listed the items on display and provided this nice timeline that keyed to the objects on display. The exhibition runs until January 20, 2019. If you find yourself in Tokyo with nothing to do, I recommend an afternoon at the Printing Museum. In the sixteenth and seventeenth centuries, pamphlets became an important vehicle for disseminating information and reporting on contemporary issues, especially during periods of crisis and instability. 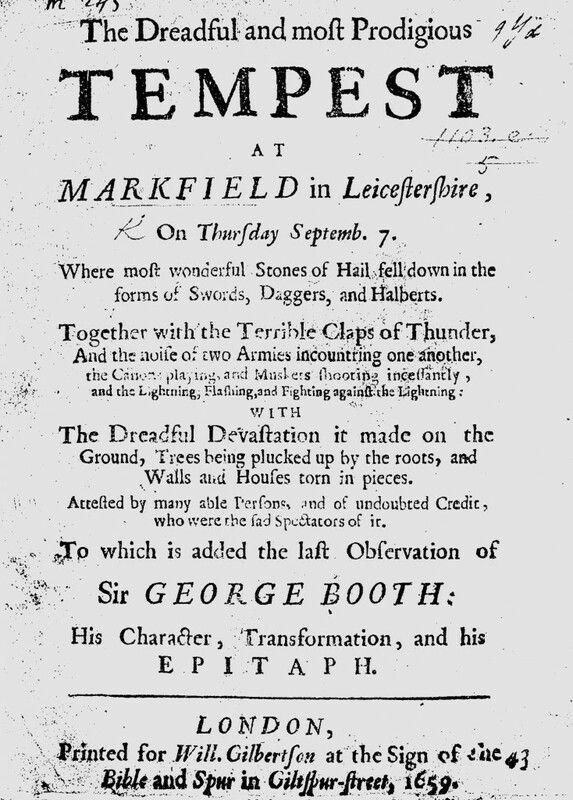 Unsurprisingly, tales of witchcraft and demonic possession turned up in these pamphlets. I spent some time today surveying witchcraft and possession pamphlets published in England. Here are a few tidbits from what I found. A little background. I restricted my search to short pamphlets, ca. 48 pages or shorter. I made some on-the-fly decisions about whether or not a pamphlet was primarily about witchcraft with possession added or primarily about possession with witchcraft added. While not exhaustive, I think this is a reasonably complete survey. Between 1566 and 1704 there were 81 different pamphlets on witchcraft and another 39 on possession. Of those pamphlets, a few treated the same event and one or two were reprinted. Joan Butts appeared in a couple pamphlets and Joan Peterson figured in three. The Witch of the Woodlands tells the story Robin, a womanizing the cobbler who is sexually abused by various female witches before ending up in what seems to have been a homosexual relationship with a beggar in London. Robin’s unfortunate tale must have been a good seller for it was reprinted four times between 1655 and 1680. Most pamphlets, however, treat a discrete set of events. Although there are a couple bumps, the 120 pamphlets were distributed fairly consistently across the 140 years. The numbers seem pretty modest, usually one or two a year. 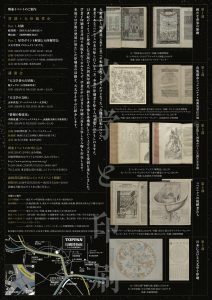 Witchcraft and possession pamphlets printed between 1566-1704 in England (click on the image for full-sized and therefore legible image). It is hard to correlate pamphlets with either legal or political events. 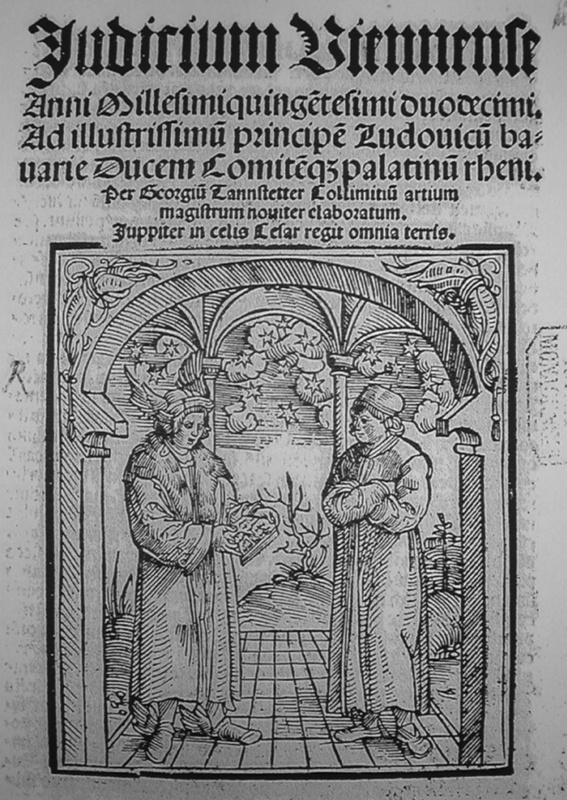 The first pamphlet appears in 1566, three years after the Elizabethan Witchcraft Act. 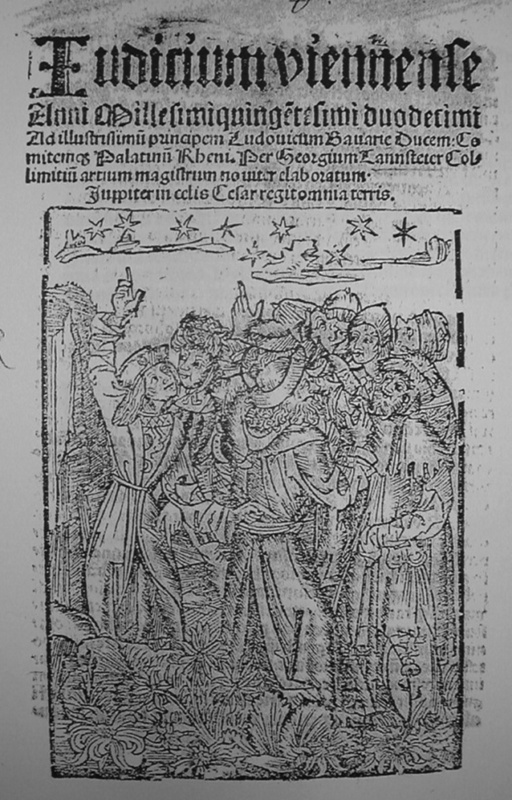 The ascension of King James I and the passage of yet another and stricter Witchcraft Act, in 1603 and 1604, seemed to have little impact on the publication of pamphlets. 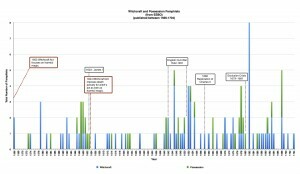 Peaks in 1682, and 1698 don’t seem to map onto significant political or social events (or at least none that spring immediately to mind). 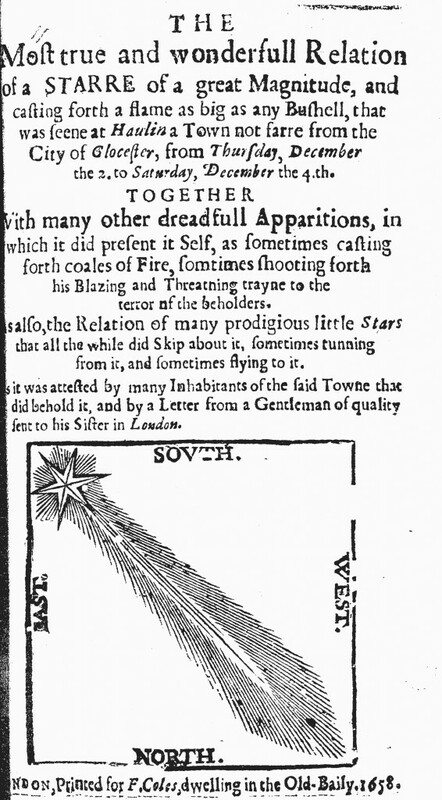 It’s tempting to see the uptick in witchcraft pamphlets in 1645 as part of Matthew Hopkins’s crusade to cleanse England of witches—Hopkins embarked on his witch-finding spree in 1644. Whatever the cause, the increase in pamphlets lasted only a year. Just for giggles, I created a word cloud for the titles of these pamphlets. 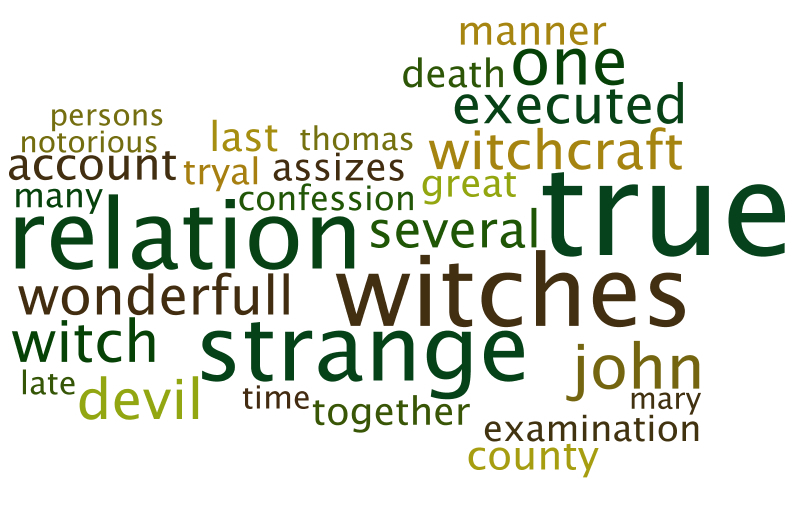 For what it’s worth, the most common word was “true” followed closely by “relations,” “witches,” and “strange.” Many of these words are unsurprising—“executed,” “witch,” and “witchcraft,” and “devil”—however, the proper names Thomas, John, and Mary seem less obvious. Another way to look at these titles would be to analyze them by decade, perhaps seeing changing patterns and practices. The 30 most common words in the titles of witchcraft and possession pamphlets (the original can be found here). What was the geographic distribution? 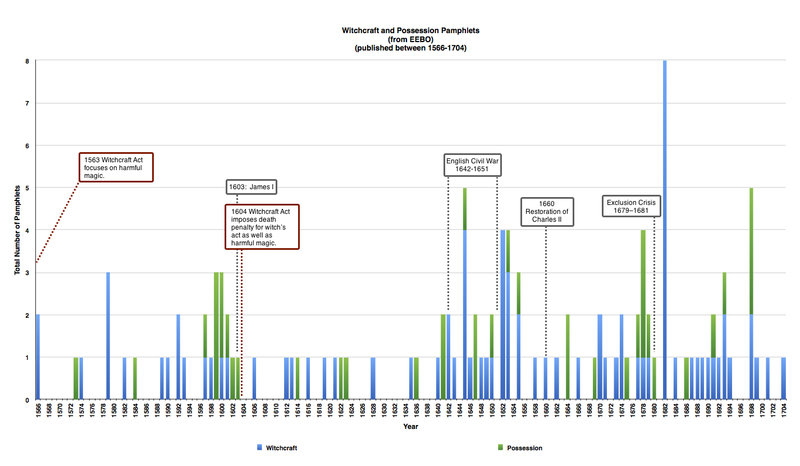 Were there local issues, perhaps agrarian crises, that correlate to the peaks in publication? What is the distribution between men and women victims and witches? Does the popular press simply not reflect the standard assumption about witchcraft and societal crises? With some luck a future post will look at some of these and related issues.